Before attending a local college fair, Bridget Finlayson and her younger sister had never dreamed of going to a university abroad. Then, the two sisters saw the man representing the University of Edinburgh and decided to hear his pitch. Two years later, Bridget Finlayson, a graduate of the Newton Country Day School, is now a sophomore at the University of Glasgow. Her younger sister, Elizabeth, a senior at Boston Latin, is considering the University of Glasgow and the University of Edinburgh. Seeking alternatives to highly competitive colleges at home, the Finlayson sisters, who are from Boston, are among a growing number of students from Massachusetts private prep schools and elite public schools who are considering and often heading to a handful of universities in the United Kingdom and Canada, a group informally known as the Scottish and Canadian Ivies. Increased marketing efforts by some of these overseas schools -- touting lower tuition rates than are proposed by their American counterparts -- are helping to persuade students and their counselors to consider a foreign university. ''You're giving up the football games and social experiences you can get at an American university, but you're getting a much better life experience," said Bridget Finlayson, who is 19 years old. ''I've grown up." This year, the Groton School has 23 students in a senior class of 87 applying to what a Groton college counselor, Marty Elkins, and others loosely refer to as the Scottish Ivies -- including the University of Edinburgh, the University of St. Andrews, and the University of Aberdeen. A growing number of students at Boston-area prep schools such as Noble and Greenough; Buckingham Browne & Nichols; and Concord Academy are seriously considering not only Scottish universities but also McGill University in Montreal and three other Canadian universities marketed as Canadian Ivy: the University of British Columbia, the University of Toronto, and Queen's University. US enrollment in Canadian colleges has doubled; it has risen by 85 percent in the United Kingdom in the past decade. Still, fewer than 10,000 Americans are studying in those countries and regions, according to the British Council and the Association of Universities and Colleges of Canada. Overseas universities are persistent in their marketing, sending a mailing at least every other week to Concord Academy, the school's college counselor said. Bill Mason, college counselor at Southborough's St. Mark's School, said he thinks families are responding to the perception that it's getting tougher to gain admission to the most selective US schools. ''Students and their families feel they need to apply to broader range of schools," Mason said. Bridget Finlayson's father, Ron Finlayson, said his initial interest was more practical: cost. Tuition at Scottish universities is lower than at most US colleges, he discovered. Annual tuition for foreign undergraduate students at Glasgow, for example, averages between the US equivalent of $14,000 and $20,000, not including room and board. Tuition at Harvard, minus room and board, runs a little less than $29,000. Boston Latin graduate Alexandra Hanson, in her fourth year at McGill, opted to go to Canada, where undergraduate tuition ranges between the US equivalent of $8,000 and $12,000, even less than many Scottish universities. ''I wanted to get out of college without debt," she said. Jim Montague, a counselor at Boston Latin, cautions that the cost of the foreign schools is not always as low as it appears, once students factor in travel, room, and board. US students not eligible for financial aid abroad can find the full tuition prohibitive, despite the comparatively lower cost. For that reason, he has not seen an increase in interest in Scottish universities at his public school. Cost aside, students say they like the idea of going to a strong university abroad, especially if their top choice in the United States rejects them. 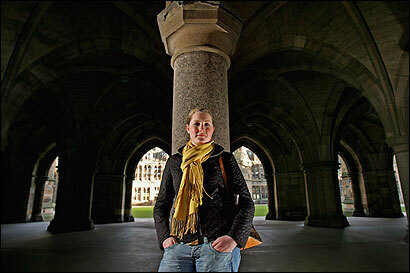 Bridget Finlayson chose the University of Glasgow after George Washington University didn't accept her. Her sister, Elizabeth Finlayson, said she'll wait to see whether Harvard or Yale accepts her before deciding whether to go overseas. In Glasgow, Bridget Finlayson said the transition to livng without family and friends in a city abroad was tough. ''It was a foreign culture with very different accents. Not being able to hear a familiar accent, it was very overwhelming," she said. The area in which she lived for her first year also was more run-down than she expected. The education, too, was a far cry from her school in Newton. Hundreds of students attended the daily lectures, and she did not know what the lecturers expected. Her grade rested on one end-of-the-term exam and an essay. The first week, she often called home crying. ''It was much more independent learning. I was terrified," she said. She has adjusted now, however, she said. Other students who have gone abroad say they do not regret taking an atypical route for college, even though some parents voice concern that their children will not have a strong alumni network in the United States when they come home to get jobs. ''Here you can get involved in ways you might not be able to in the US," said Groton alumnus Ben Flatgard, who is in his third year at the University of Edinburgh in Scotland. A self-described average lacrosse player at home, he is captain of the university team at Edinburgh and member of the university's trade and investment club. Better yet, it's easier for him to see more of the world. He just returned from a trip to London and will leave in a week to tour North Scotland. He already has visited Norway, Italy, Portugal, and France, as well as other countries. ''Talking to people in the States and jobs, they seem to be pretty impressed and interested," Flatgard said. ''People recognize it gives you a different perspective," Flatgard added of his experience. ''It's been great."